THE FUNDRAISING campaign created to aid the recovery of Liverpool fan Sean Cox has smashed its initial €2million target. The Sean Cox Rehabilitation Fund was set up to support the 53-year-old Co Meath native, who requires round-the-clock care after being attacked by Roma fans ahead of a Champions League semi-final encounter on April 24, 2018. A host of events were held to help boost Sean’s recovery, culminating in a charity football match between a Liverpool Legends XI and an Ireland Legends XI at the Aviva Stadium last Friday, April 12th. Nearly 27,000 people attended the game where they were joined by Sean, who was making his first trip out of the hospital since the attack and received a warm response from the watching crowd when he appeared on the big screen. President Michael Higgins also met Sean’s wife Martina and children Jack, Shauna and Emma on the pitch in what was an unforgettable night for the Cox family. They joined by a star-studded selection of big names from the world of football with Kenny Dalglish and Mick McCarthy managing the two teams while the likes of Robbie Keane, Ray Houghton and Jason McAteer took to the pitch. The match, organised by Liverpool Football Club, proved an entertaining one with the Reds legends running out 2-1 winners on the night with thousands of fans treating Sean and his family to a powerful rendition of the Merseyside team’s anthem You’ll Never Walk Alone. “The last 12 months have not been easy for us, but what has helped us get through this difficult journey has been the outpouring of support and genuine concern for Sean,” she said. 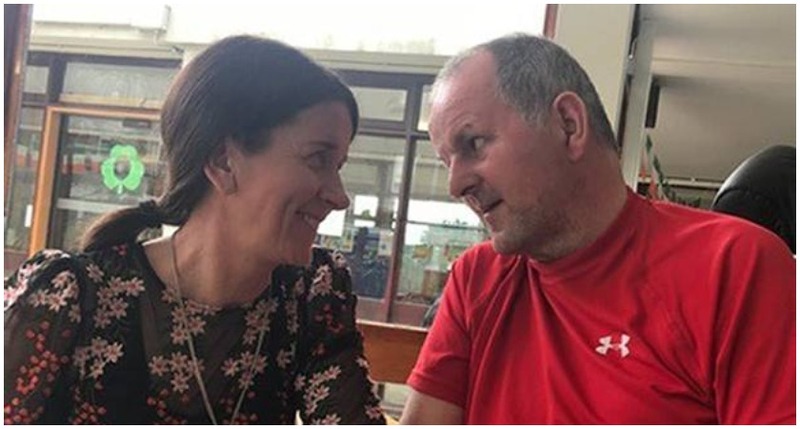 Despite hitting the initial target Stephen Felle, chairman of the Sean Cox Rehabilitation Fund, says that while fundraising will continue with Sean’s family beginning to plan for the future. “We really need to help the Cox family and give them space in terms of planning the next state of Sean’s recovery. “An awful lot of events have taken place over the last six or seven months to push us towards that target of €2million that we set ourselves. Show your support for Sean by visiting www.SupportSean.com and making a donation.